Everyone loves lists. They range from Hollywood's 30 Hottest Celebrities to the NBA's Greatest 50 players of all-time. Lists headline the covers of magazines, are entertaining to read, and always spark debate. In fact, many of you surely enjoyed viewing ESPN's 25 year anniversary celebration that unveiled seemingly endless 'Top 25 of the last 25 years' lists. Whether it is the Top 100 courses in the country, the Top 500 golf holes in the world, or simply the best muni in the area; golf consistently generates some of the best and most controversial lists around. Although you won't find perennial list attendees like Pebble Beach and Augusta National in Idaho, it doesn't mean there is a shortage of great golf here. If fact, it is often the dramatic surroundings that Mother Nature offers at and around golf courses that separates the 'headliner' courses from the rest. While our area doesn't offer the tropical bliss of Hawaii or the crashing waves found on the Monterey coast, how can you argue with the mountainous beauty of Sun Valley or the breathtaking views of timber lined Lake Coeur d'Alene that are only found here? However, this list has nothing to do with golf holes that are exceptionally pretty or even holes that offer a great birdie opportunity. Oh no, in fact it is quite the opposite. This list is a compilation of the nastiest, most punishing, round-ruining holes in the region. These are the holes that make you tremble on the tee box and cause your muscles to freeze when money is on the line - this is Idaho's Cruel 18. To gain consideration as the opening (1st) hole on the Cruel 18, the hole must be the opening (1st) hole at its respective course. The 2nd Cruel 18 hole must be the 2nd hole at its originating course and so on until the 18th hole where only the cruelest finishing holes in the state can qualify as candidates. It is amazing how often difficult holes appear as the same number at their respective course. For example, hole #5. How do choose among Blackfoot's 237 yard Par 3 to a postage stamp green, Circling Raven's 574 yard par 5 with bunkers and trouble abounding, and Headwaters' 601 yard par 5 that plays into the prevailing wind? It is not only a matter of personal opinion, but you also must weigh out the alternatives for using different holes and courses throughout the Cruel 18. No course can be featured more than once on the Cruel 18. This severely increases the difficulty. Courses like Black Rock, Hidden Lakes, Headwaters, and Tamarack (the most difficult rated courses in region) would dominate the list with several holes if this wasn't a parameter. However, since it is, a premium is placed on which holes to use from the most difficult courses in the state while still accommodating other holes from area courses which may not be quite as challenging, but mean enough to qualify. All holes are measured from the tips. This parameter goes hand in hand with parameter #2 since the most difficult courses generally have the longest holes to consider. In addition, some holes can be much tamer when they are played from even one tee box closer. For example, I played a par 3 at the beautiful Promontory Golf Club (Dye course) in Park City that played 299 yards from the tips and only 199 yards one tee box up. That's a significant difference. The course should feature an even mix of holes in order to accurately simulate a real course. Most courses feature four par 3s, ten par 4s, and four par 5s to equal a par 72 (Generally featured with two par 3s, five par 4s, and two par 5s on each nine). A new course designing trend that is becoming increasingly popular is to feature a more even mix of holes with five par 3s, eight par 4s, and five par 5s. The Cruel 18 will adopt this fashionable, more recent design trend that offers a greater variety of holes. A solid representation should be given throughout the state. Providing a balanced mix of holes from each portion of the state is not only more enjoyable to read, it challenges you to give consideration to virtually every course throughout the area. Trust me, at the end of compiling your own Cruel 18 list you will have looked through every scorecard you own at least a half dozen times. So, those are the parameters. Stretching out to 7801 yards and par 73, the Cruel 18 will bring even the best golfers to their knees. The stage is set, the holes diverse, and the challenge brutal, so grab your longest driver and your 'A' game, you're going to need them. Idaho Falls Country Club - 423 yard Par 4: Whoever said that the first hole at a golf course should be easy didn't tell William Bell, the designer of Idaho Falls Country Club. Hopefully you warmed up since the tee shot here is in plain view of the clubhouse and all of your fellow golfers. IFCC starts off with a bang by featuring this 423 yard par 4 that doglegs right and heads hard uphill. The often windy conditions coupled with the maturing tree line and smallish green gives golfers a taste of what they are about to face in the Cruel 18. Sun Valley Resort - 446 Yard Par 4: You may not see Brad Pitt at this hole, but it may remind you of his popular movie, A River Runs Through It. Not just once though, the river comes into play twice! The green is not visible from this elevated tee box perched on the top of a hill and your drive requires a shot that is ripped out and over the grove of trees protecting the dogleg left. Once in position, your approach shot must carry the river a second time as well as carry the bunker protecting the front of the green. 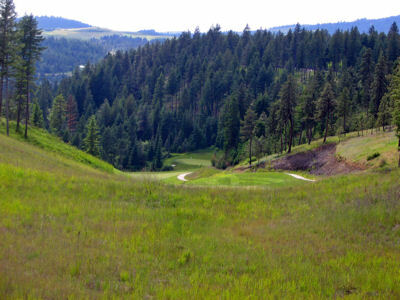 Club at Black Rock (Coeur d'Alene) - 611 Yard Par 5: Hopefully you enjoyed the "warm up" the first two holes offered because you are now faced with the longest hole on the most difficult course in Idaho. The severely elevated tee box requires over a 200 yard forced carry over a waste area down to a fairway where you can't even see your targeted landing area. If you're lucky enough to find the fairway with your first shot, you'll discover the first fairway ends and 150 yards of rough grass looms in between you and the second fairway further down the slope. Think you can reach it in two? Think again. A wide and rocky crevasse protects the entire front of the small, sloping green and trees and a bunker flank the sides and back. If you find the spectacular views of Lake Coeur d'Alene and the intimidation of the tee shot too much of a distraction, you can always hope to run into John Elway, a two-time Super Bowl champion and Black Rock member, who may be willing to impart some "local knowledge." Osprey Meadows at Tamarack Resort (McCall) - 608 Yard Par 5: When traveling to McCall you may want to leave your 3 iron at home and replace it with a fly fishing rod because you may need it on the 4th hole at Tamarack. Offering a split fairway off the tee, the left fairway is the wider and safer route. Going to the right fairway will give you your only chance at getting home in two by blasting a second shot over a fly fishing pond. Not only is the fairway on the right more difficult to hit to, but a large tamarack tree looms in the right rough ready to cause havoc on your approach shot to the green. A stream and long bunker separate the two fairways while a pair of bunkers and pond protect the green. If you put a 'snowman' on your scorecard it may not be too late to just pull out your fly fishing rod and call it a day. Blackfoot Golf Course - 237 Yard Par 3: When gazing at the green at Blackfoot's 5th hole, one might have thoughts of Royal Troon's famous 8th hole, aptly named 'Postage Stamp' due to the size (or lack thereof) of the miniature green. In reality, these holes have several similarities. Both feature tiny greens, both have bunkers in play, and both almost always are played with a stiff wind blowing. Other than location though, the biggest difference between these holes is that Blackfoot requires you to hit the small green from over 100 yards further out! Often downwind, this hole is extremely difficult to hit and hold while the alternative of 'running one up' is often thwarted by the bunker protecting the left side of this tiny, sloping green. Since going long will almost surely post a double-bogey on your card, you may consider taking a 5 or 6 iron off the tee and then chipping one close in hopes of saving par - your ego may suffer, but at least your score won't. Blue Lake Country Club (Twin Falls) - 200 Yard Par 3: This hole plays 200 yards whether you're hitting from the ladies tees or from the tips. Now 200 yards is a fairly stout par 3, but when you factor in the 150 foot drop to a green that sits back in the Snake River with a water hazard along the back and left side and a bunker on the right, the hole takes on a whole new level of 'mean'. Even the slightest mishit is severely punished due to the drastic elevation change. If you're looking for your first hole in one here, look elsewhere. A tee shot that is lucky enough to find the putting surface has a pretty good likelihood of plugging. Highland Golf Course (Pocatello) - 470 Yard Par 4: You know you've reached the #1 handicap hole at Highland when you look at the scorecard and realize this hole is longer than the par 5 12th and only 20 yards shorter than the downhill par 5 11th. Actually, this hole was a par 5 at one time. However, when tee shots off of #9 kept pelting golfers on the #7 tee box, a change had to be made. Unfortunately for you the golfer, that change only equated to moving the tee box up 10-15 yards and offering one less stroke to score par. The green is protected by steep hills on both sides. To the left is heavy rough and o.b. while missing to the right side will leave you a pitch shot from the 8th fairway to a green so elevated that you won't be able to see the flag. Trust me, unless you play in a group of scratch golfers, someone in your foursome will be waiting for the 8th tee box to clear so they can go down and play their wayward ball. Headwaters at Teton Springs (Victor) - 517 Yard Par 4: Just how tough did golfing legend 'Lord' Byron Nelson design this 517 yard par 4? Tough enough that it beat out the 503 yard par 4 third and the 601 yard par 5 fifth holes to represent Headwaters on the Cruel 18. Now that is tough! Uphill from tee to green, this hole plays into the teeth of the prevailing winds ripping out of Pole Canyon making this hole nearly superhuman to reach in regulation. While the fairway is large, the left side falls off hard into long rough and native grasses. Unfortunately, staying too far to the right side of the fairway leaves you the shallowest angle at which to approach this green that also falls away from you. So just how do you conquer this brutal hole? Heck if I know, in two tries I haven't pared it yet! 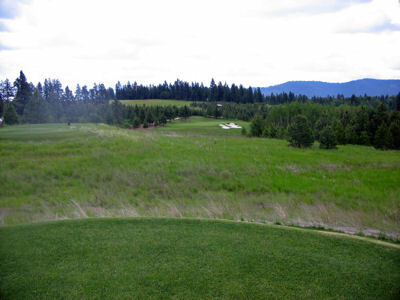 The Links (Post Falls) - 780 Yard Par 6: "Par 6?! I didn't even know that was legal!" is the typical response I hear when telling fellow golfers about this hole. 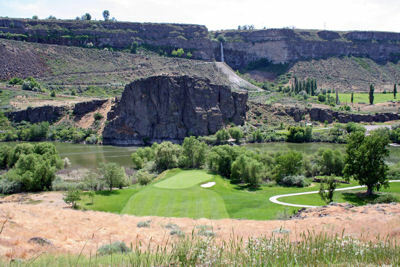 Taking the place of one of the par 5s and giving the Cruel 18 a scorecard equally a par 73, this monster hole may be the most talked about hole in Idaho other than Coeur d'Alene's floating green. Obviously long at 780 yards, The Links sports one of the few par 6 holes in all of golf and it's a doosy. Even great players will struggle to reach this hole in three strokes and a small forest of trees gobbles up approach shots left of the green. Practicing your fairway woods is a good idea before playing this hole, because even getting assistance from the prevailing wind can't help a topper get to the green. Hidden Lakes (Sandpoint) - 464 Yard Par 4: When the next closest tee box is nearly 100 yards ahead, one might expect some forgiveness on that hole. Well, you came to the wrong place. Water is on 16 of the 18 holes at Hidden Lakes and #10 is maybe best the wettest of them all. Water trails the hole along both sides of this tight fairway and three bunkers await long tee shots that don't follow the dogleg right. The water hazard along the right side goes all the way up to the green where it protects the hole along with two more bunkers. Bogey is a good score here since any shot along the way has a great chance of finding a water or sand hazard. If that isn't enough to distract you, keep your eyes peeled for the resident moose on this stunning course. Shadow Valley (Boise) - 188 Yard Par 3: Intimidation spoils performance in all sports. Just ask the NBA players that have beat their man on a drive only to find Shaq's 7'1" 325 lb. frame awaiting them. Needless to say, the anticipation of knowing Shaq is lurking in the middle causes many players to throw up ill-advised shots as they brace themselves for the worst. Named "Shadow's Alley", the 11th hole at Shadow Valley strikes fear into golfers that know once they get past this hole that the Shaq-like 12th and 13th holes await them at this public course in Boise. Your best stroke of the day is required when firing your tee shot at this narrow green that demands pinpoint accuracy while the depth of this mounded green requires precise distance control. The flag will be found in one of three sections of the green, each of which will require a different club from the tee. So muster up your courage and find a way to score par on this tree lined hole because you may need some extra stokes heading into the next two holes that "The Shadow" has waiting for you. BanBury Meadows (Eagle) - 544 Yard Par 5: Site of the 2005 U.S. Girls' Junior tournament, BanBury Meadows threw this difficult par 5 at the best 17 and under female golfers the world had to offer. Trouble awaits with a hazard cutting in front of the tee boxes and then running down the left side of the hole before cutting diagonally across the fairway. Long hitters will have to decide between trying to bomb their drive 260-280 yards on the fly over the hazard or laying up. As you near the green, two bunkers rest at the 100 yard mark while three additional sand hazards protect the green. With o.b. along the left side of the hole and water wide right, little forgiveness is at this difficult hole at this quality public facility. Circling Raven (Worley) - 253 Yard Par 3: If you're pulling off the head cover to your driver or 3 wood on a par 3, then you're either at the wrong tee box OR the 13th hole at Circling Raven. Stretching over 250 yards, this par 3 requires 235 yards of carry over protected wetlands. If the distance and elevation drop weren't difficult enough, a huge bunker with brilliant white sand awaits anything short and right. By the way, the "bail out" area is to the left of the green where you'll have to punch out through the trees while you'll ball rests on a bed of pine needles. Coeur d'Alene Resort - 203 Yard Par 3: Does the hole always play this long? No. In fact, the distance changes daily. Is the green huge? Yes. 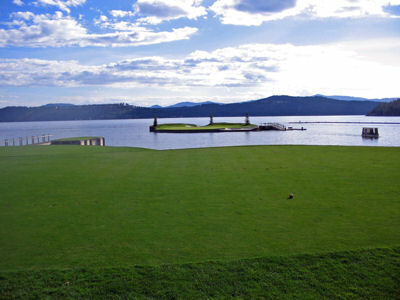 But I don't care how big the green is whenever a shot, which will almost surely be into a head wind, misses the putting surface the ball will find itself resting on the bottom of Lake Coeur d'Alene. Don't worry, you won't be alone. I've played this hole three times now and have watched six out of nine of my fellow golfers sigh as they observed their ball splashing in the water surrounding the world famous floating green. That's Cruel 18 material. Pinecrest Golf Course (Idaho Falls) - 440 Yard Par 4: Undoubtedly you've heard the phrase "older than dirt" when referring to the antique age of something or someone. Well, if you were around to see Pinecrest go in, you aren't much younger than dirt! Opened in 1936, Pinecrest is arguably the finest municipal course in the state and has been the host of every major tournament in Idaho throughout its history. Host of this past year's High School 5A State Championships, Pinecrest offered up this 440 yard par 4 (par 5 for women) to the state's best prep players to test their nerves down the stretch. With tall pine trees and long rough lining both sides of the fairway and Yellowstone Highway roaring along the right o.b. line, the pressure of this hole is being able to execute an accurate drive. So break out your new hybrid club or whatever you can hit 200+ yards and straight because anything out of the fairway will almost surely result is a bogey or worse since little to no forgiveness is offered. Quail Hollow Golf Course (Boise) - 521 Yard Par 5: Designed by renowned architects Bruce Devlin and Robert von Hagge, Quail Hollow offers a target golf experience like no other found in Idaho. Carved in through the canyons and foothills of Boise, nearly every hole is unique at Quail Hollow and none more potentially deadly than the 16th. Players are often rattled heading into this tee shot as they lament their score from the prior hole; a narrow, downhill 239 yard par 3 to a well protected green. Not overpowering in length, your approach shot(s) on #16 needs to be well thought out. If you're going for the green in two you'll often be faced with a near impossible angle to a green so narrow it will make your alma matter's hallways seem as wide as the Grand Canyon. Anything short will end up rolling into a lake while shots that go long will find the sage brush covered waste area. Laying up however is no easy task. Five fairway bunkers bisect the fairway leaving a narrow landing area to hit before hitting to a green that can vary two clubs lengths either side of the middle depending on the pin placement. Good luck, your mental and physical game is going to need it! Ridgecrest Golf Club (Nampa) - 417 Yard Par 4: This hole has received its fair share of criticism, and to those critics I say "Buck up!" The uniqueness and challenge of this hole is virtually unmatched. Now, would I want to see a hole like this more than once a round? No way! But holes like this are what the Cruel 18 is all about. The severe uphill approach is AT LEAST a three club difference from the yardage and the green is super shallow, but fairly wide. If your approach is short of the green, you may find it rolling back down to you. If your approach goes long into the bunker behind the green, you will need Phil Mickelson like touch to keep your sand shot from going off the front of the green and back down the hill. This hole very well may take the cake as the nastiest hole on the Cruel 18! Falcon Crest Golf Club (Kuna) - 479 Yard Par 4: By far, the cruelest and best finishing hole in the state! A dramatic ending awaits you at Falcon Crest's 18th hole. A large lake looms between your drive and the green. Even the best of tee shots can't get any closer than 160-170 yards due to the large lake that looms between your approach shot and the green that is tightly tucked to the water. Many players will find themselves over 200 yards out and potentially in some long rough. If you are in the later category, a bail out strip of ground is provided along the left side of the lake allowing you to use three shots to get to the green. However, if you're going for the green in regulation make sure to take enough club because there is plenty of room on the hill behind the green, but your Pro V1 will simply be another tragic donation on a long list of shots that have fallen victim to the ball-hungry lake if you leave it short. Well, there it is. There are several wonderfully difficult holes throughout Idaho that made my "Honorable Mention" list and weren't featured in the final Cruel 18. I'd love to hear from fellow golfers throughout the state giving an argument for holes they feel should have made the cut in the final 18 or an entire Cruel 18 they've compiled themselves. Let the debates begin! Suggestions or Requests? Have an article idea? Email us with any ideas or suggestions of an article you would like to see and we'll work and putting it on the web site.